On the morning of the 26th of June, a very pregnant Lola pig gave birth to six little bundles of joy – Pumpkin, the only girl and her 5 brothers Napoleon, Squirt, Bert, Earnie and the littlest of all Eddie. 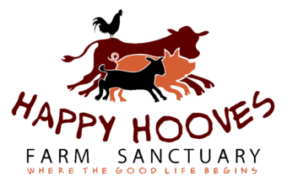 These are the first piglets to ever be born at Happy Hooves. We never anticipated such an event, as we do not breed our animals or condone such activities (Lola and her friend Bindi arrived at Happy Hooves both very pregnant). It really is a joy watching Lola feed and tend to her babies knowing that they will not be taken from her and subjected to the horrific practices performed in piggeries (i.e. cutting tails and teeth, de-sexing all without anesthesia). We hope Lola and her beautiful babies enjoy a long happy life together here at the sanctuary.